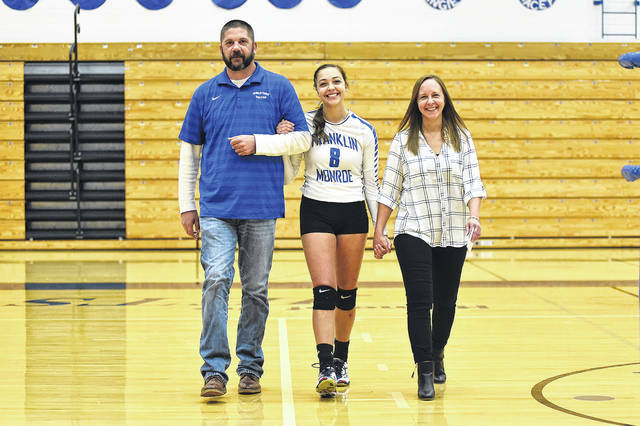 Franklin-Monroe’s Brigette Filbrun walks across the floor with her parents during Senior night festivities last Thursday. Franklin-Monroe’s Chloe McGlinch gets a smash across the net during a non-conference match with Preble Shawnee last Thursday. 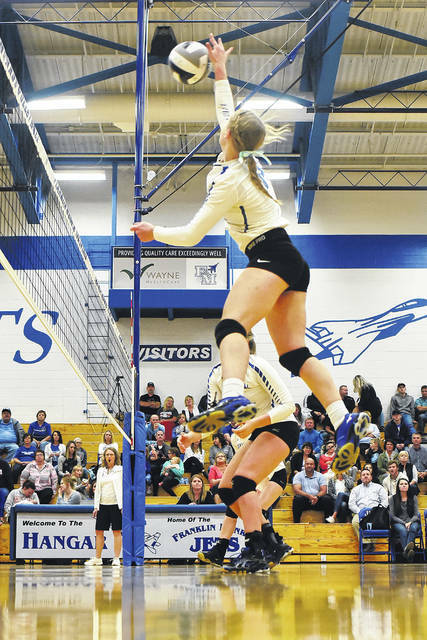 Franklin-Monroe’s Chloe Peters goes up for a spike in a non-conference match with Preble Shawnee last Thursday. Franklin-Monroe’s Corina Conley tries to block a shot from Preble Shawnee during their non-conference match last Thursday. 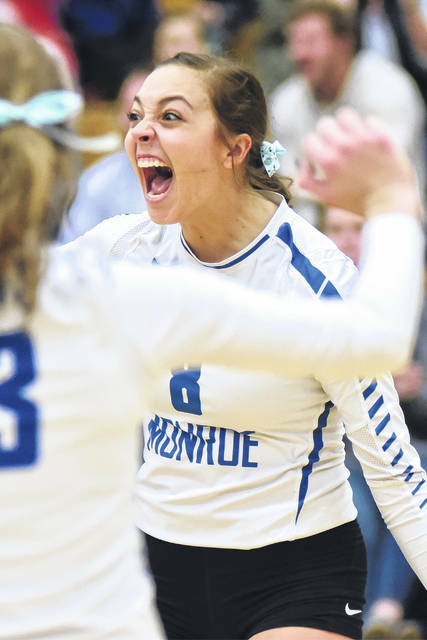 Franklin-Monroe’s Kennedy Morris shows some excitement in the Jets win over non-conference foe Preble Shawnee last Thursday. 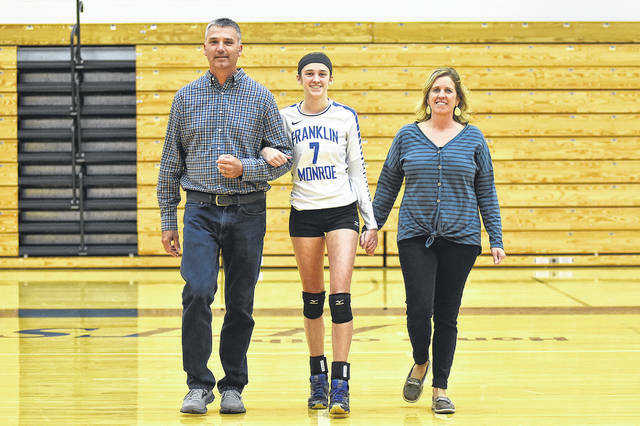 Franklin-Monroe’s Kennedy Morris walks across the floor with her parents during Senior night festivities last Thursday. Franklin-Monroe’s Kloe Zink gets a tip over the net during a non-conference match with Preble Shawnee last Thursday. 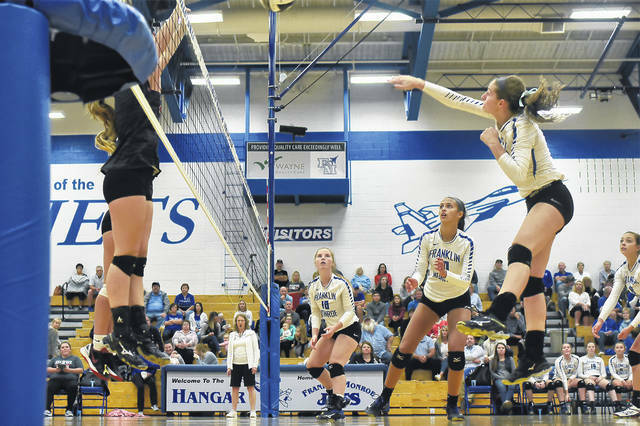 PITSBURG – Franklin-Monroe hosted Preble Shawnee on Senior night and took the non-conference game in three straight sets 25-12, 25-15, 25-16. Prior to the game, the Jets recognized their two seniors Brigette Filbrun and Kennedy Morris. Brigette Filbrun in the daughter of Rick and Angie Filbrun. Her activities include Volleyball 4 years, Softball 4 years, Class Officer 4 years, Student Council 3 years, SADD 3 years and National Honor Society 2 years. Brigette plans to attend Indiana University East and major in High School Math Education and to become a High School Math Teacher. Kennedy Morris is the daughter of Mike and Amanda Morris. Her activities include Volleyball 4 years, Basketball 4 years, Softball 4 years, SADD 4 years, Class President 4 years, National Honor Society 2 years and Yearbook 2 years. Kennedy plans to attend college and become a police officer. “We came out really strong tonight and took it to them in the opening set, it was nice to see us do that. 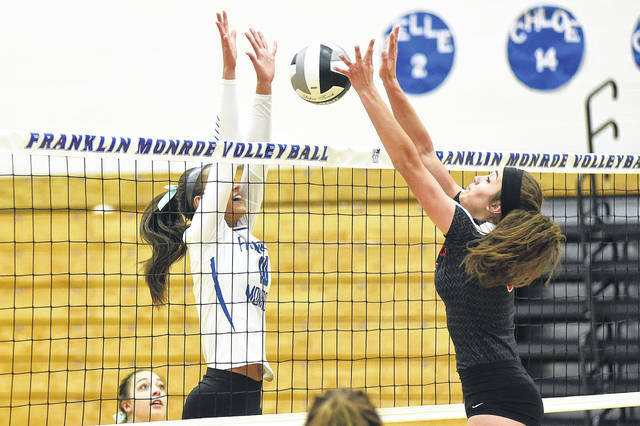 We had a lull in the second set, we tend to do that as well, but we finished strong and it’s nice to get the win on Senior night,” Franklin-Monroe coach Angie Filbrun said. Franklin-Monroe put the hammer down early and Preble Shawnee never really got anything going in the first set. The Arrows were a little more competitive in sets two and three, but the Jets were just too much on this night. 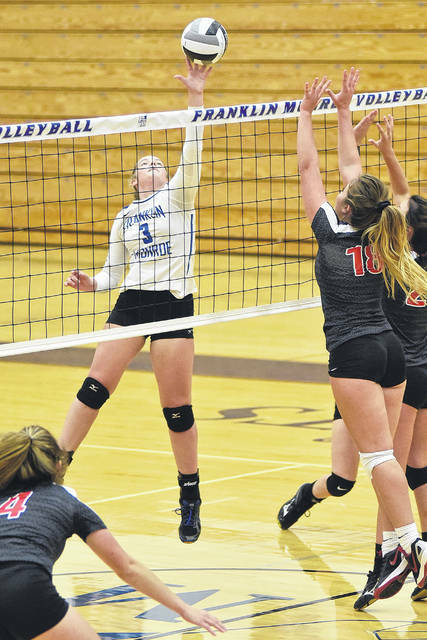 Franklin-Monroe stat leaders for the game were: Corina Conley (14 kills, 11 serve points, 4 blocks), Kloe Zink (6 kills, Chloe Peters (13 serve points, 11 digs, 5 kills), Belle Cable (19 digs, 16 serve points), Janessa Koffer (15 serve points), Chloe McGlinch (14 serve points, 9 digs, 8 assists) and Kennedy Morris (14 assists, 9 digs). When asking coach Filbrun about her two seniors, one being her daughter, you could hear the pride and emotion in her voice on what they mean to the team. That future is bright for the Jets considering the junior varsity team finished the season 12-0 in the Cross Country Conference and 19-3 overall which put a big smile on Coach Filbrun’s face when talking about them. “We have a lot to look forward to with what we have coming up, and just two spots to fill we expect to be decent over the next few years. They worked their tails off, worked well together and learned to adjust as we had things happen where we had to pull different players up and yet they still were able to find ways to win,” Filbrun praised. Franklin-Monroe varsity volleyball finishes the regular season with an excellent 18-4 overall record and 10-2 in the Cross County Conference. They play next Wednesday at 6:30 p.m. against Cedarville in the first round of the Division IV sectional tournament at Covington High School. “We scrimmaged Cedarville earlier in the year, so we’ve seen them once, but just like everyone else I’m sure they’ve improved so we’re going to prepare hard, go out and give it our best and see what we can do, the girls are very excited for the post season,” Filbrun concluded.